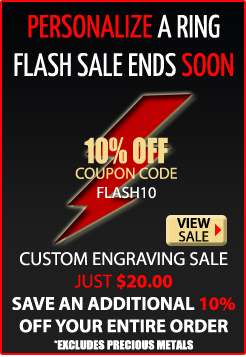 Use coupon code FLASH10 and save 10% off of your entire order. Spring is in the air and so is our love for savings! Show that special someone you care and get them a quality ring that is backed by our lifetime warratny! Save 10% site wide during our Spring Break promo. This is good all month. So whether this is a gift for that special day, or if it's something you've decided to pick up after deciding to tie that knot - we've got what you need. This will include all of our Tungsten, Titanium, and even our precious metal collection rings. That coupon code is "BEMINE"
We have temporarily reduced the price of our custom engraving service (applies to traditional engraving only) on the inside and outside of our rings. Most rings can be engraved for just $20, Stainless Steel rings can currently be engraved for just $10!